The AHP series in-line air heaters are used to heat clean, dry air or gas for baking, drying, laminating, metal working, packaging, plastic welding, preheating, sealing, soldering, shrink fitting and synthetic fabric sewing. AHP series air process heaters provide hot air and gas up to 1000°F (540°C) with infinite control by varying the voltage and/or the air flow. Closed loop control can also be achieved with temperature controllers (section P) and "T" fittings to mount thermocouples. both 120 and 240 Volts. †Indicates Watts per inch of heated length. Use the table above to determine minimum required flow rates. Minimum CFM Required 3/8" Dia. 1/2" Dia. 3/4" Dia. 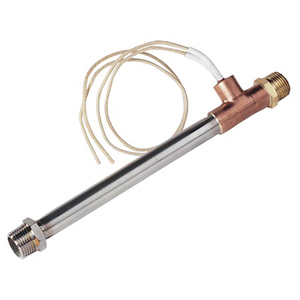 참고: To order heaters without NPT fittings add suffix "-NF" to model no. Price for heaters without fittings is $40 for AHP-374 series, $49 for AHP-505 series, and $62 for AHP-756 series.